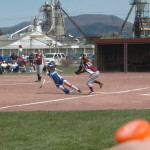 Brooke Paddock attempts to tag out a Granville base runner. The runner slid in safely. After starting the season 0-4 in games decided by less than two runs, it was only a matter of time before Whitehall pulled out a close game. Last Wednesday, the Railroaders did just that, as Brittney Putorti tossed a three-hit shutout in a 2-0 win over Adirondack League foe Hartford. Putorti allowed only three base runners and struck out seven batters in the complete game effort and Carli Varmette gave her all the support she needed, driving in a run in the third inning. Whitehall’s Victoria Christian and Paxton Peterson scored the only runs of the game. Putorti and Hartford’s Morgan Wicks engaged in a classic pitcher’s duel. The two combined to allow only seven hits and one earned run in the game. Wicks struck out nine and allowed only one free pass in seven strong innings. The Railroaders, who have been plagued by a lack of timely hitting and defensive miscues, manufactured both of its runs and played a flawless game in the field. Wicks and Putorti cruised through the first two innings, before Whitehall managed to scratch a run in the bottom half of the third inning. Christian led off with a single and then stole second and third base before Ariel Ayers reached on a walk to put runners on the corners. Varmette then stepped to the plate and dropped a single in front of a diving center field to give Whitehall a 1-0 lead. The Railroaders added an unearned run the following inning to extend their lead to 2-0. With one out, Paxton Peterson singled to leftfield and advanced to second base on a bunt by Rachel Lavin. She made it to third on a wild pitch and scored on a pop fly by Christian that was misplayed by Hartford’s defense. Hartford tried to mount a comeback in the final inning, putting the leadoff hitter on, but Putorti slammed the door to preserve the win for Whitehall. The Railroaders picked up their third win of the season Monday night, knocking off Warrensburg 4-0. Putorti pitched one of her best games of the season, allowing only four hits and striking out seven in a complete game effort. Ariel Ayers went 2 for 4 and drove in two runs and Shyla Stafford had a pair of hits for Whitehall. The Railroaders scored twice in the third inning and tacked on two more runs in the sixth. The win came two days after Whitehall lost to Granville 14-1 in a non-league game on the Horde’s home field. Granville’s offense was firing on all cylinders in the game. Lauryn Zovistoski hit a leadoff homerun and Amy Baker and Hannah Bassett each drove in three runs for Granville. Rachel Lavin doubled for Whitehall. After the game, Granville held an emotional ceremony to honor Putorti, who pitched on the Granville field for the final time. Granville’s field is named in honor of Putorti’s father, the late Ken Burch. On Friday, Whitehall was shut out by Argyle 7-0. Elizabeth Richards had eight strikeouts in the game and helped her own cause with a homerun. Varmette had a triple for Whitehall, one of only two hits the Railroaders recorded in the game. On April 23, the Railroaders traveled to Fort Ann to face a Cardinals team that had opened the season a perfect 6-0 and had blown out Argyle and Warrensburg the week prior. Unfortunately for Whitehall, Fort Ann’s hot hitting continued as the team pounded out 16 hits in a 15-0 rout. Bri Amodio and Casey Batchelder both went a perfect 3 for 3 on the day Molly Bailey struck out eight and allowed on one hit in a five inning complete game. The Cardinals scored seven runs in the first inning and had an insurmountable 14-0 lead after three innings. Whitehall travels to Salem tomorrow and Saratoga for a non-league match up with Spa Catholic before returning home to host North Warren on Monday. The Railroaders are 3-6 in the Adirondack League and 3-7 overall. They need to finish 6-3 over their final six league games if they hope to qualify for postseason play.